Scientists have identified a type of stem cell that appears to fuel the growth of brain tumours. The Canadian and American researchers say their discovery could lead to new ways of targeting cancer cells. The study, published in Nature, shows the cells can be identified by a marker on their surface called CD133. 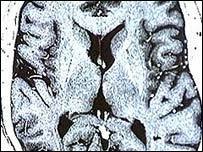 Brain cancer is often rapidly fatal, even with aggressive treatment. Around 4,300 adults develop brain tumours each year in the UK. Stem cells are immature "master" cells that can be programmed to form different kinds of tissue. Scientists hope they could be used to treat a number of currently incurable diseases, such as Parkinson's and diabetes. But stem cells have already been linked to the development of leukaemia and breast cancer. It had been thought that the formation of nerve cells in the brain was completed by birth. But recent findings suggest that the brain, like other organs in which cancers can arise, contains a stem-cell population that can give rise to a range of cells which carry out different functions. This study suggests that cancer-inducing mutations accumulate in the long-living normal stem cells. The researchers took the cancer stem cells, which carried the marker, from human tumours and injected them into the brains of mice. It was found that as few as 100 of the cells led to the formation of tumours in the animals, whereas injections of large numbers tens of thousands of "ordinary" cancer cells failed to do so. Writing in Nature, the team led by Peter Dirks from the Hospital for Sick Children in Toronto, Canada, said it also offered a "previously unidentified cellular target for more effective cancer therapies". Michael Clarke, of the University of Michigan Medical School, writing in Nature, said the research was a "significant step in the fight against these dreaded diseases". He added there appeared to be important differences between the way healthy and cancerous stem cells renewed themselves. However, Dr Clarke warned: "A possible complication is that the mechanisms known to regulate cancer stem-cell self-renewal also regulate the process in normal stem cells." But he said that, unlike normal stem cells, the replication of cancer stem cells is not tightly regulated, suggesting there are differences in how self-renewal operates between the types of cells. "This gives hope that the isolation of cancer stem cells, coupled with our knowledge of the mutations causing cancer, will result in ways to eliminate cancer cells while sparing normal tissues."